Lifelong Port Washington resident, Marjorie C. Poole “Marge”, 86, died Tuesday, April 24, 2012 at the Harbor Cove in Port Washington, Wisconsin. She was born June 13, 1925 in Port Washington to Alois and Elsie Scheftgen Betz. Growing up on East Prospect Street she was a drum major in high school; graduating from Port Washington High School in 1943. She began working at Simplicity Manufacturing in Port Washington as a secretary. On June 9, 1945, she married Erin H. Poole of Port Washington at St. Mary’s Catholic Church in Port Washington. After her marriage Marge attended the Wisconsin Institute of Mortuary Science in Milwaukee and became a Wisconsin licensed funeral director in 1948. Together with her husband, she worked as a funeral director and bookkeeper for the Poole Funeral Home and Lakeside Movers, which was founded by her husband. 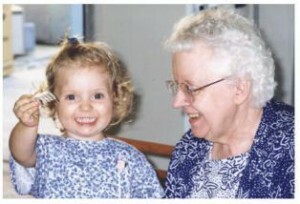 Marge was a mother, caregiver, homemaker, friend and compassionate listener. She provided great care to past family members. Her home was open to all. Her husband Erin preceded her in death July 5, 1993. In 1998 she was recognized by the Wisconsin Funeral Directors Association for 50 years of service to families and her community, continuing the commitment of her husband Erin and his parents W. D. and Mayme Poole to funeral service. She was a Girl Scout Leader when her daughters were young, a member of the Port Washington Woman’s Club, charter member and guide of the Judge Eghart House, charter member of the Port Washington Historical Society, Ozaukee Historical Society, St. Mary’s Christian Women, Catholic Order of Foresters, Wisconsin Funeral Directors Association, National Funeral Directors Association and National Selected Morticians. Over the years she enjoyed ceramics, collecting angels and tending to her African Violets. She was a voracious reader, sharing bags of books with family and friends. Quiet in her own right, she enjoyed time spent with family and friends. She could be found sharing an afternoon lunch, a game of bridge or chat on the telephone. Marge is survived by her children Elizabeth “Betsy” (Dave) Schmitz of Saukville, Ellen (David) Schroeter of Bayside, Erin W. Poole of West Bend and Patrick (Lisa) Poole of Port Washington. Further survived by 7 granddaughters, sister Gert (Paul) Klemens of Wauwatosa, brothers-in-law Rich Russart of West Bend and Allan (Char) Bley of Racine, nieces, nephews, other relatives and friends. She is preceded in death by her husband Erin, sister Audrey Russart and sister-in-law Patricia Bley. Funeral services 6 pm Tuesday, May 1, 2012 from the Poole Funeral Home to St. Mary’s Church, Port Washington for Mass at 6:30 pm. Rev. Thomas Lijewski and Rev. James Ernster will celebrate Mass. Visitation 2:30 – 6 pm Tuesday with a 2:30 pm rosary. Interment St. Mary’s Cemetery, Port Washington, Wisconsin. Memorials to the Port Washington Historical Society appreciated.